When exiting the local Cineplex, I usually end up thinking about the atrophying of my culture’s taste. Americans seem to value a story’s execution more than its essence. Blandness doesn’t matter as long as it’s told with fast motion and loud sounds. Give us no strong tastes, nothing too exotic or subtle. We want milk, stylishly prepared and served -- mostly. But there are exceptions, one of most recent being the indie import Slumdog Millionaire. Jamal Malik is having a bad day. 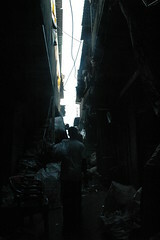 The Mumbai ghetto dweller didn’t expect to get arrested. Or undergo water torture. Or be hung by his arms. Or have his toes hooked to a car battery. He was in the middle of a winning run on a regional edition of Who Wants to Be a Millionaire, earning more in minutes than he expected to in a lifetime. Which is why the police want to (ahem) “question” him. How can a slumdog, a chai wallah, an utter insignificant succeed where doctors and lawyers and trivia buffs have failed? He must be cheating. Only Jamal isn’t. His hardscrabble life has provided all the answers he needs, answers he hopes will save him and the woman he loves from a gangster who hunts them both. At first glance, Slumdog seems to celebrate everything I dislike in cinema. It’s super-stylized. Fast cuts abound. Extreme camera angles are the norm. Pounding pop and hip-hop beats punctuate the proceedings. (Think of the eye- and ear-searing style of Man on Fire.) But director Danny Boyle understands something important, namely that style should serve story. To put flesh on the cliché, style ought to always advance a narrative’s fundamentals, ought to always be building the characters and plot and themes and settings. At this, Slumdog never fails, and that makes its over-the-top presentation a joy to behold. May its celluloid cousins take note: It's time to move on to meat.